The Dialogues in Urban and Regional Planning series offers a selection of some of the best scholarship in urban and regional planning from around the world. The internationally recognized authors of these award-winning papers take up a range of salient issues from the theory and practice of planning. 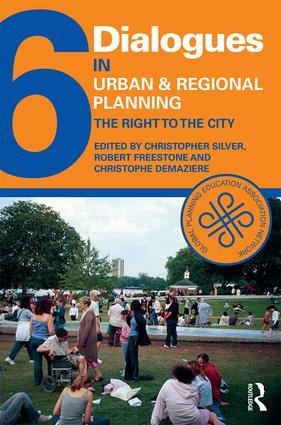 This 6th volume incorporates essays that explore the salient issue commonly referred to as "The Right to the City." This theme speaks to a growing new movement within planning theory and practice with multiple aims and strategies but with the common objective of advancing a more just and equitable world. The right to the city functions as a manifesto advancing academic explorations of the opportunities for, and barriers to, expanding human and environmental justice. At the same time, it extends beyond academic inquiry to engage directly with the policy, legal and political dimensions of human rights. The right to the city has been invoked by global bodies such as United Nations-Habitat and the United Nations Educational, Scientific and Cultural Organization to bolster not only their agendas around fundamental human rights but advance urban policies promoting inclusion, sustainability, and resilience. Dialogues 6 offers engaging explorations into the academic expeditions by the global planning community that have helped to energize this movement. The papers assembled here through processes of peer review represent an invaluable collection to untangle the complexities of this dynamic new approach to urban and regional planning. The Dialogues in Urban and Regional Planning (DURP) series is published in association with the Global Planning Education Association Network (GPEAN) and its member national and transnational planning schools associations. Christophe Demazière is Professor of urban and regional planning at the Université François-Rabelais de Tours (France). He was trained in economics in France (PhD, University of Lille, 1996) and in planning at the University of Wales-Cardiff and the Katholieke Universiteit Leuven. At the University of Tours, he runs an International Master in Planning and Sustainability that is fully taught in English. His recent recent research deals with strategic spatial planning, metropolitan institutions, and small and medium-sized towns. He is the author or editor of ten books, including Creative Approaches to Planning and Local Development. Insights from Small and Medium-Sized Towns (edited with A. Hamdouch, T. Nyseth, J. Serrano) published by Routledge in 2016. Robert Freestone is a Professor of Planning in Faculty of Built Environment at UNSW Australia in Sydney. His research interests lie mainly in planning history, metropolitan planning, heritage and planning education. His recent books include Place and Placelessness Revisited (2016), Exhibitions and the Development of Modern Planning Culture (2014), and Urban Nation (2010). He is a council member of the International Planning History Society and was President 2002–2006. At UNSW he was Head of the Planning Program 2001–2004 and an Associate Dean (Research) in 2013-2017. He was elected a Fellow of the Academy of Social Sciences in Australia in 2008 and the Institute of Australian Geographers in 2009. Christopher Silver, Ph.D., FAICP is professor of urban and regional planning in the University of Florida’s School of Landscape Architecture and Planning. He served as chair and co-chair of the Global Planning Education Association Network and President of the Association of Collegiate Schools of Planning and of the Society for American City and Regional Planning History. He is author or co-author of five books, including Planning the Megacity: Jakarta, Indonesia in the Twentieth Century (Routledge, 2008) and Planning and Decentralization: Contested Spaces for Action in the Global South, with V. Beard and F, Miraftab (Taylor and Francis, 2008) as well as numerous articles, chapters, book reviews, paper presentations and speeches. He is currently completing a monograph tentatively entitled, Four Centuries of Water Management in Jakarta and is co-editor, with Andrea Frank of Educating the World of Planning: Beginnings, Global Movement and Future Prospects (Springer 2017). Published in association with the Global Planning Education Association Network (GPEAN), and the member planning schools associations, representing over 360 planning schools in nearly 50 countries around the globe. Dialogues in Urban and Regional Planning offers a selection of the best urban planing scholarship from the world’s planning school associations. The award-winning papers presented illustrate some of the concerns and the discourse of planning scholars and provide a glimpse of planning theory and practice around the world. All those with an interest in urban and regional planning will find this collection stimulating in opening avenues for research and debate.